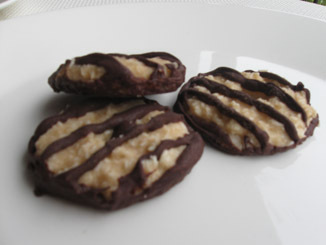 Based on the Girl Scouts’ Samoa or Coconut-deLites, these cookies are so much more delightful! Mix flour, baking powder, baking soda and xanthan gum. Set aside. In a small bowl beat together flax seed and water. Add in applesauce and mix well. In a large bowl cream together shortening and sugar. Beat until light and fluffy. Add in flax/applesauce mixture and beat until smooth. Add in vanilla. With mixer on low, slowly add in flour mixture. Mix until completely incorporated and dough is uniform. Shape into a cylinder with a diameter of about 2 1/2 inches. Wrap in plastic wrap or wax paper and freeze for at least 25 minutes. Preheat oven to 350oF. Remove wrapping from chilled dough and place on a cutting board. Slice a circle about 1/8 inch thick and lay flat on the cutting board. Use a tiny circle shaped cookie cutter or a large round cake decorating tip to cut a hole in the center of the slice. With a spatula, carefully transfer the formed cookie dough to a large cookie sheet lined with parchment paper. Repeat, using up all the dough. Bake 6-8 minutes, until lightly brown around the edges. Remove immediately and cool on wire racks. In a saucepan combine sugar, corn syrup or agave and water. Cook over low heat, stirring regularly with a whisk. Use a pastry brush dipped in water to brush the sugar crystals down the sides of the saucepan. Once the sugar is dissolved raise the heat to medium. Let the mixture come to a bowl, while whisking constantly until it turns to a deep amber color. Remove from heat and quickly drop a small amount of the mixture into the small glass of water. If the caramel becomes hard, then it is ready. If not, return the pan to cook on medium heat. Keep testing until the caramel is hard. Remove from heat. Carefully whisk in shortening, coconut milk and vanilla, the mixture should bubble violently for about 10 seconds. If the caramel isn’t smooth, return the pan to low heat. Whisk until smooth. Remove from heat. Set aside. When ready to dip cookies, melt chocolate and margarine in a double boiler and mix well. Place the cookies in the chocolate. Use a fork to pull them and place them back on a parchment-lined cookie sheet. Let chill in freezer for about 30 minutes. Add coconut to the caramel. If the caramel is too thick it may need to be warmed a little. Take cooled cookies and gently dip them completely in the caramel. Place them back on the cookie sheet lined with parchment paper. Freeze until set, about 5 minutes. Use the remaining melted chocolate to drizzle stripes over the top of the cookies. Refrigerate until set.